(UPM, Helsinki, 21.12.2017 10:00) - At Unesco World Heritage Site Verla in Kymenlaakso, a new heating plant will be built to ensure the site remains in good condition in the future. 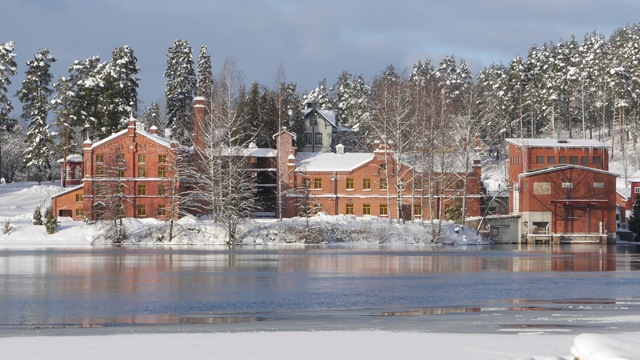 The Verla groundwood and board mill, owned and maintained by UPM, is one of the seven World Heritage Sites in Finland. "It is important to us that we preserve the World Heritage Site for future generations. After Verla was named a World Heritage Site in 1996, several projects have been carried out to preserve the site. The buildings have been fitted with fire protection systems, for example, and because the mill stands by the Verlankoski stream, a longitudinal dam has been constructed to protect the buildings from flooding and water leakages. The heating solution being implemented in the upcoming winter is a significant investment in Verla's long-term protection," explains the Museum Director Ville Majuri. When the groundwood and cardboard mills were still in operation, the brick buildings were heated. However, the heating was removed after their operation ceased in 1964. When the buildings are heated again, their preservation conditions will become more favourable. When a building is heated, the heat is conducted through its structures, drying both the air inside the building and the structures in turn. This also stabilizes harmful changes in indoor temperature and reduces the damage caused by moisture. Heating the facilities also protects the preserved machines and equipment. The new heating system at Verla will be installed into the existing boiler room of the drying plant that was built in 1893. The room will then return to its former purpose. The new boiler produces heat using renewable wood pellets and is installed between the old boilers. "The project has been developed in co-operation with the National Board of Antiquities. It is wonderful that we can utilize the old facilities and structures of the preserved mill, such as the boiler room and chimney, for their original purpose," Majuri continues. Until now, Verla has only been open to the public during the summer season. Heating enables the development of tourism and a longer - at best, year-round - operating season. For the technical implementation of the heating solution, UPM has collaborated with KSS Lämpö, a subsidiary of KSS Energia. The company's field of operation includes heating solutions for different areas. KSS Energia owns two hydropower plants at Verla World Heritage Site. "I am pleased with the result. We found a practical solution for heating the preserved buildings," states Ilmo Penttilä, KSS Lämpö CEO. In its statement, the National Board of Antiquities has recommended the heating solution. "By heating the buildings moderately and in a manner that takes their cultural and historical value into account, the life of the drying plant and the entire Verla World Heritage Site will likely be extended. The project has been well prepared and it will likely have a positive effect on preserving the World Heritage Site as well as its cultural and historical value.